Once in a generation, a gifted group of individual girls soccer players comes along that can say they got the absolute very best out of one another. Individually, Jesuit had enough star power to light up the longest of city skylines. When people look back five years from now, this year's team could very well have 11 players suiting up at the Division One level. But the Crusaders' lasting legacy will lie in the potency of the group. Few teams can say they maximized their potential. Yet that will be Jesuit's trump card when it comes to debating the greatest teams in state history. The work wasn't done when Jesuit suited up against the Cavs in the Class 6A state championship game. Jesuit was the prohibitive favorite. A loss would've been one of the most shocking in OSAA lore. But by match's end, the Crusaders, as was customary all-season long, left no stone unturned, no question unanswered about their all-time status. 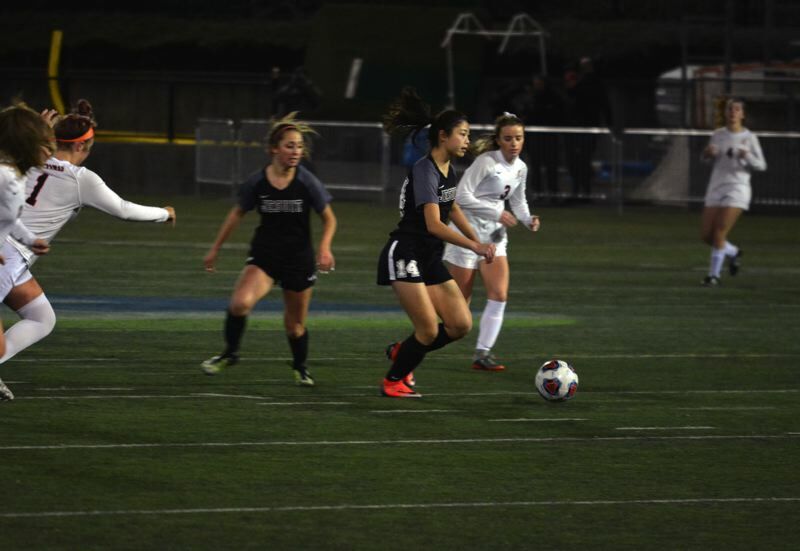 With four goals from the brilliant Callan Harrington, a hat track from Jade McClellan, consummate playmaking from Katie Duong and yet another shutout from Mary Votava and her backline, Jesuit pummeled Clackamas with an 8-0 trouncing at Hillsboro Stadium for its second straight 6A title. "We had a lot of pressure on us, but we didn't let it get to us," McClellan said. "We kept telling each other 'Calm is Contagious.' We stepped out on the field and did our job. We worked hard every day starting with the first day of camp in August. Everyone individually is so different and talented. Personality-wise and on the field, we really brought it together and made it work as a team." "All of our hard work came out in that game," Votava said. "Clackamas threw almost everything they had at us and we were able to handle all of it. Props to them, but we worked together and came out on top. We knew the bar that was set for us, but we were excited to show what we were made of. We were so ready to play, it was amazing." In all, Jesuit scored 128 goals while allowing just one all year, a feat that in all probability won't be seen for some time. The Crusaders went 19-0 with 15 of their wins coming by five goals or more. Jesuit outscored its playoff opponents 39–0 in just five games. The Crusaders scored at least eight goals 10 different times with four of those matches coming in the playoffs. It was utter annihilation. Jesuit never took a night off or cheated what many call the beautiful game with mailed-in efforts. 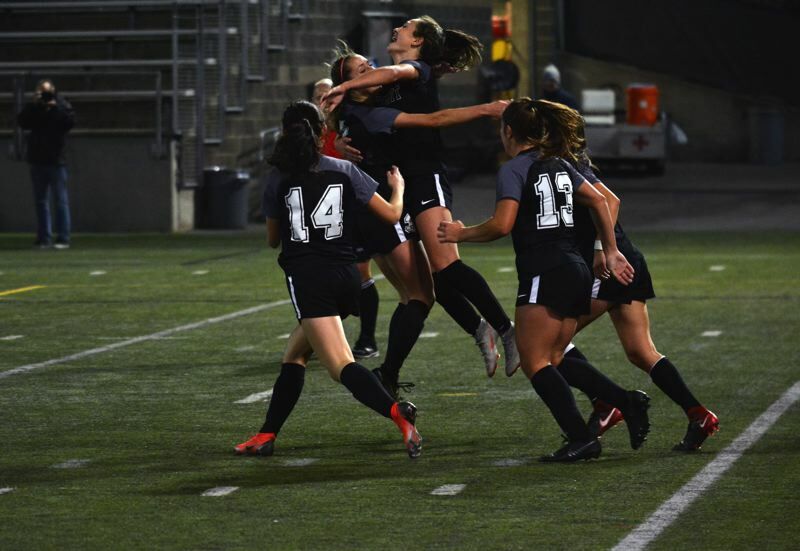 From opening night in late August through the final whistle against Clackamas on a cool November evening, the Crusaders treated each foe with the same viciousness and vivacity. Stature or ranking had no pertinence. Jesuit pounded everybody put in its path and scraped the plate with five seasons' worth of blowout victories. The routs weren't run-ups in terms of score, but the ultimate sign of respect toward their opponents. "Sometimes when you're winning by a lot, you can get complacent," McClellan said. "We worked really hard to stay wanting and hungry for it." 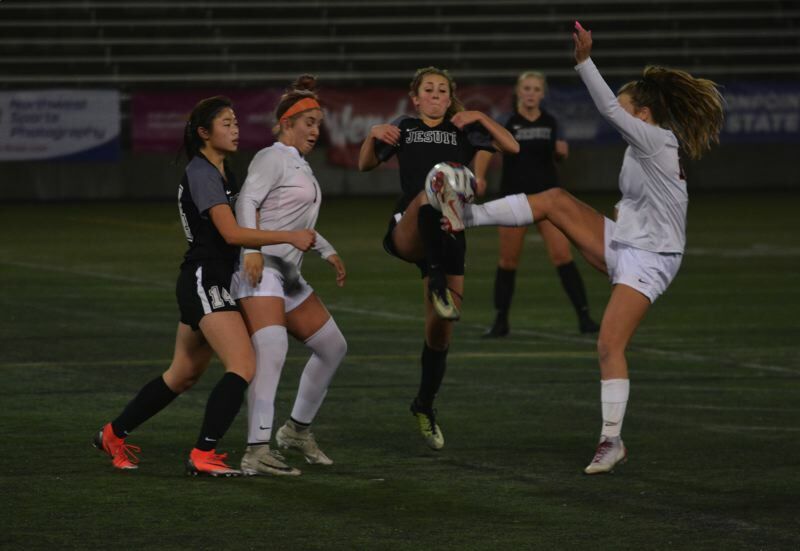 Believe it or not, there was one "rough" patch in the midseason when Jesuit beat Aloha 3-0 and Westview 2-0 when Harrington and some other starters were out. Even then, Votava, Ella Nelson, Rachel Hickey and Madison McClellan kept the Crusaders clean with strong communication and teamwork in the back of the defense. Votava was rarely challenged, but when she was, the junior Notre Dame did her job. Clackamas created a handful of chances, including an opportunity to slice Jesuit's 2-0 lead in half early in the second half, but came up empty. Nelson scored the only non-Harrington/McClellan goal off a header against Clackamas. Other than that two-game stretch, Jesuit was every bit the best team in the nation that every pundit pegged them to be. And to think, this was supposed to be a rebuilding year after losing one of the more decorated senior classes in school history. Go figure. 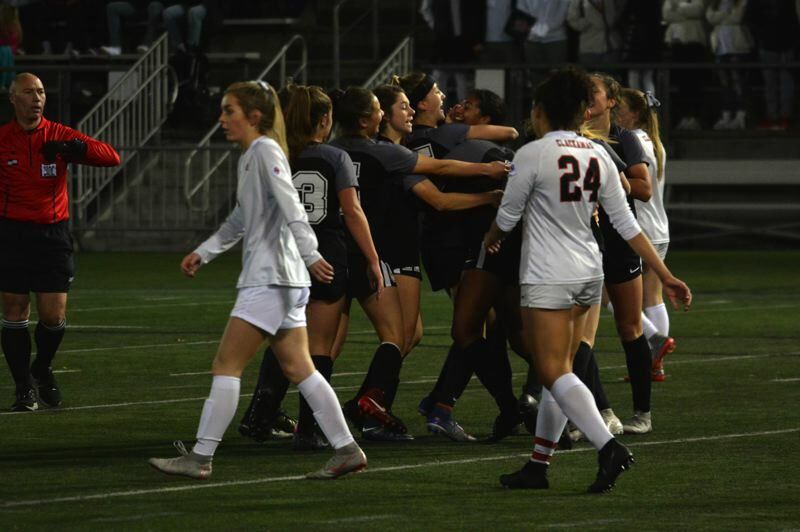 "Props to all of the other teams that have come through Jesuit, but I don't know if anyone has ever scored that many goals in a season," Votava said with a smile. "Hopefully we go down as one of the greats. We were able to find each other on the field like nobody else." At a powerhouse like Jesuit where players hope to use the school as a stepping stone to the next level, agendas, outside influences and ego can sometimes get in the way of the team game. It comes with the territory. Jesuit is a private school with no feeder program. Each player makes a decision to go there on their own accord. They don't grow up playing for the same youth teams, for the most part. Yet, this team took a self-denying persona to the pitch. Their European-style of pass-and-move, find the open feet and get to an open area bred contagious movement and a joy of seeing the teammate beside you succeed. It wasn't fake or begrudging either. After each score, all 10 Crusaders seemed to race each other to get the goal scorer — whether it was Harrington, McClellan or Duong — and mob them. "We knew our roles on the field, it was about the team every game," McClellan said. "When it's about the team first, the chemistry just happens naturally. You get goals, you get stats. But stats weren't at the top of our minds. It was more about how do we pull through with the win, every day." Votava said the Jesuit players are best friends on and off the field, a team that took a trip to Bend to build bonds and hangs out at school. It's that kind of chemistry that creates deep bonds on the field. "Jesuit is such a good community," Votava said. "Everyone is there with love. You see each other in the hallways and you always say 'hi'. Everyone is just so excited to see everyone. There isn't really competition on our team, it's everyone trying to help each other be better. We're not trying to score for ourselves, we're trying to make the team score higher." Duong and Harrington harvested a special symbiotic connection that at times was breathtaking to take in. With Duong's phenomenal passing and Harrington's fantastic speed and finishing ability, the duo hooked up for countless goal connections and set nets ablaze. Harrington has made a second home at Hillsboro Stadium the past two years. 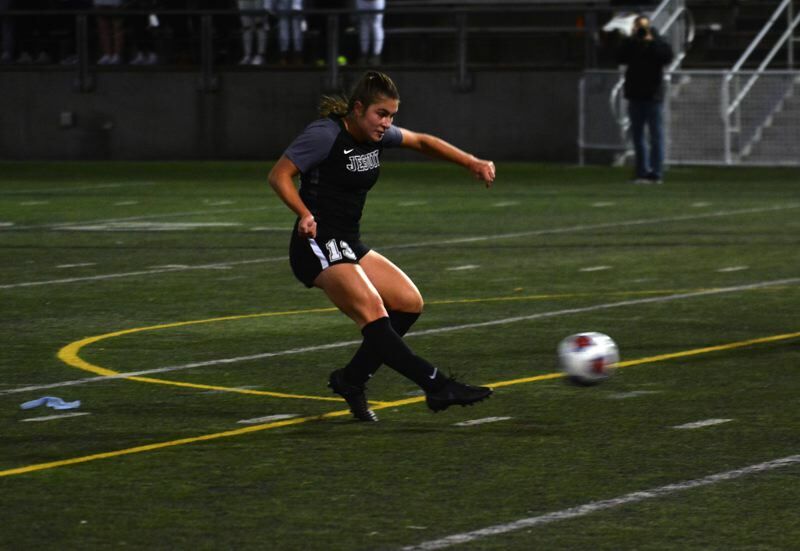 After scoring two goals against Sunset in the state title game last season, the dynamic junior doubled her output versus the Cavs, cleaning up rebounds around the cage or simply outracing Clackamas' entire backline with sprint champion-esque velocity. "Her athleticism is off the charts," Duong said of Harrington. "The runs she's able to do make her super easy to play through. She's just a fun player to play with. If my passes are a little bit off, she's so fast, she'll still get there. She has a great attitude and brings great grit to the team." "She really took it upon herself to lead the team in a special way on and off the field," McClellan said of Harrington. "And we all know she's one of the fastest players out there." McClellan, a dynamic midfielder who could toggle between attacking and holding, bagged her first hat trick of the season against Clackamas. Two of those goals came from long range, including a 35-yard blast in the first half that put Jesuit on the board, 1-0. "You have to be aggressive, but I owe it to my teammates," McClellan said. "They were always in the right place at the right time. I was just lucky to be on the end of (those passes)." Before the year began, head coach Steve Fennah shifted Duong, who didn't play for Jesuit her junior season while playing club, to the attacking midfield spot rather than play outside. The shift took the top of an already detonative offense. Duong's innate passing ability and penchant for threading through balls and crosses at impossible angles to places only she could see was preternatural. Everyone from Harrington to Alison Sasaki to freshman Naomi Alvarez benefitted from Duong's passing, which made the game easier for Jesuit's forwards and opened up the field. "Assisting is my favorite thing, I think it's more rewarding to set up the offense," Duong said. "I've been in a lot of playing situations, so that's where I learned that." The state title game was the last for Duong, Gabi Navarro, Madison McClellan, Kari Zimmerman and Aspen Hawkins in a Jesuit uniform. However, Jesuit will return seven of its 11 starters including Jade McClellan, Votava and Harrington.